More vegetables for breakfast, I say!! This recipe is inspired by a couple of different ones from Yotam Ottolenghi's amazing cookbook, Plenty. I love this cookbook because the combinations of ingredients are surprising, yet actually quite adaptable. For example, in this recipe he uses kirmizi biber, a Turkish spice blend that I've never seen, but suggests you could use sweet paprika and some cayenne. I use spinach or kale instead of arugula, marjoram instead of sage, and I've added some tomatoes. Also, I just cook it on the stovetop instead of baking it, which makes it easier. Even with all these changes, it still tastes unusual and wonderful. See what I mean? Inspiring. Remove stems from kale and slice into 1-inch ribbons. Heat 2 T. olive oil in a skillet over medium flame. Add kale/spinach and garlic, and cook until the leaves are wilted (if you're using kale, it's extra-tasty if you let it brown a bit.) Season with salt and pepper as desired, add paprika/aleppo pepper and marjoram. Stir in tomatoes, then make little wells to crack the eggs into, so they form little islands. Cover the pan and cook until egg whites are solid but yolks are still a bit soft. Drizzle with remaining olive oil. Serves 2. Oranges give this dish a sweet, tangy flavor that’s mellower than the vinegar used in many greens recipes. Although, if your oranges aren't very tart, you may want to add a splash of balsamic or any other good vinegar (just not that harsh white vinegar you can buy by the gallon!) Chard has a natural saltiness, so don't add too much salt, or it tastes a bit funny. Enjoy hot or cold as a side dish, or combine with a grain such as quinoa or farro for a hearty salad. Using a sharp knife, cut thick slices off the ends of each orange. Stand them on flat ends, then slice the rest of the peel off. Cut sections free by slicing downward along the membranes, and remove seeds. Set orange sections aside with all their juice. Wash chard thoroughly and tear leaves into 1 to 2 inch pieces. Chop the stems crosswise into 1/4 inch slices. Heat olive oil in a large skillet over medium flame. Add chard, garlic and chile, toss to coat with oil, and cook until tender. Add oranges, and cook another minute to warm them and reduce the juice a bit. Season with a little salt and lots of pepper. Serves 4. Baby spring turnips are tender and mild, and can be eaten whole with their greens, like radishes. Turnips get a bad rap, but they are really fantastic when braised with honey and ginger! Ginger crème fraiche makes this dish especially nice. You can also use larger turnips and bunches of turnip greens. Just cut large turnips in 1-inch wedges, and if they are the really huge purple ones, you might want to blanch them for a few minutes and drain off the cooking water to remove bitterness. Melt butter in a large skillet over medium heat. Thoroughly wash the turnips, leaving the greens attached, and lay them in the pan. Add the broth, half the ginger and half the honey. Cover tightly and simmer 10 to 15 minutes, until the turnips are tender. The sauce should be reduced to a nice glaze - if it is not, remove the turnips and turn the heat up to reduce. Season as needed with salt and drizzle over turnips. Mix crème fraiche with remaining honey and ginger, and season with salt and pepper. Drizzle over turnips or serve on the side. Serves 2. Here's a great recipe I forgot to post from my soup article last fall in Edible Santa Fe! 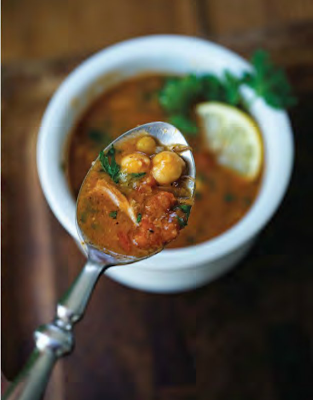 This Moroccan soup is traditionally served during the Muslim holy month of Ramadan. I made a delicious stock by cooking lamb shanks in a crock pot all day, but it would probably still be good if you take shortcuts like using stew meat and canned stock, and even canned chickpeas. Many families add rice or vermicelli as well. Some like it thick, while others leave it more brothy. Recipes vary widely, so feel free to experiment. Heat the oil in a large stock pot. Brown the lamb shanks on all sides. Add the celery, onion, tomato paste, and spices. Fry for a few minutes, until the tomato paste is bubbling and the onions have begun to soften. Add the water and tomatoes to deglaze the pot. Transfer to a crock pot and add the chickpeas and lentils. Cook on low heat for about 8 hours, until everything is tender and the stock is flavorful. Remove the meat from the lamb shanks, chop coarsely, and return to the pot. Shake flour with water and add to the soup in a thin stream, stirring constantly, until the soup is thickened to your liking. (You may not need to use it all.) If you prefer to use eggs for thickening, beat them and add in a thin stream, stirring constantly. Add the cilantro or parsley and cook 5 to 10 minutes more. Garnish with lemon wedges. Serves 6 to 8.